Tokyo. Laid down at the Ishikawajima Zosen Fukagawa Yard as Subchaser No. 194. Departs Saiki on patrol. Later that day arrives back at Saiki. At 0931 departs Saiki on a sweep. Arrives back at Saiki and departs later that day on a submarine sweep. At 1305 arrives at Sukumo. At 0856 departs Sukumo on patrol. Departs Sukumo on patrol and returns later that day. Departs Sukumo and later that day arrives at Saiki. Departs Saiki and at 1709 arrives at Kure. Assigned to Vice Admiral Hosogaya Boshiro's (36) (former CO of MUTSU) 5th Fleet in SubChasDiv 13 with CH-25 and CH-26. SubChasDiv 13 departs Yokosuka. Patrols in the Aleutians. At 0900 SubChasDiv 13 (CH-25, CH-26 and CH-27) and CH-24 departs Yokosuka. Twenty ships of 5th Fleet, including light cruisers KISO and TAMA, three destroyers, three kaibokan, three minesweepers and four transports carry the Adak-Attu and Kiska Occupation Forces to the Western Aleutians. The Adak occupation is cancelled and the Adak-Attu Occupation Force is directed to seize only Attu. Grateful thanks to Mr. Gilbert Casse of France. Thanks go to Bruce Abele, son of LtCdr Abele, for identifying CH-27's final CO, Lt Shinoda Isamu. 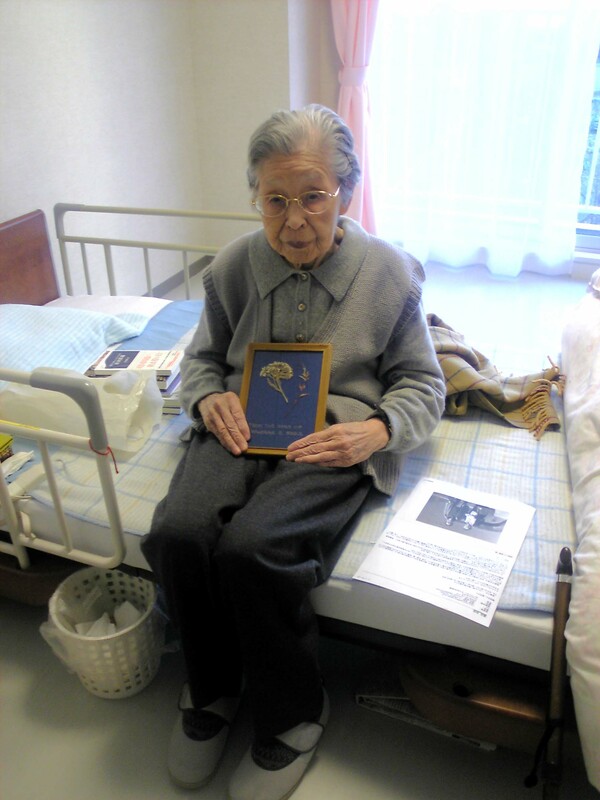 Abele also located Shinoda's son and 97-year old widow, Shinoda Chiyo, shown below with pressed flowers from Kiska sent by the sons of Catherine E. Abele.